Nuts are the most popular paleo snack. But among the best nuts to consume is CASHEW NUTS. It is naturally sweet and crunchy and added to many dishes for a richer flavor. Not only are cashews best-tasting. It is also loaded with a nutritional value not really known to us. Did you know that this flavorful nut brings you a lot of healthy benefits? Perhaps after finishing this article, you are eager to include it in your daily grind. 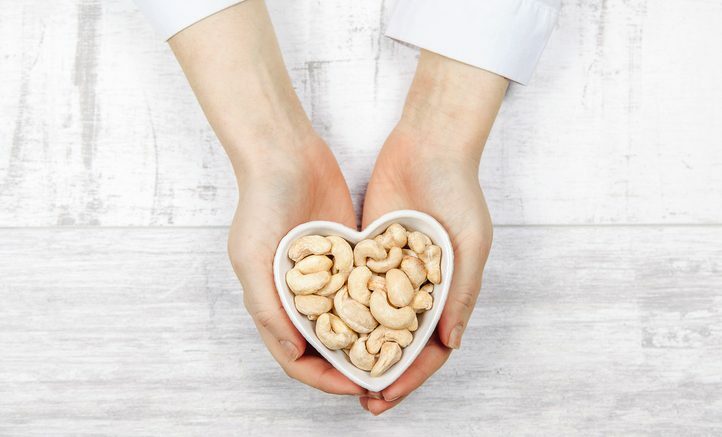 Have a healthy heart by eating cashew nuts. It lowers the risk of cardiovascular disease. Magnesium, which help lower blood pressure can be found in these nuts. It has a cholesterol-lowering effect which decreases your bad cholesterol (LDL). High LDL mainly trigger heart disorders. It helps maintain our eye health. The antioxidant pigment called Zeaxanthin can be found in cashew nuts. The pigments form a protective layer over our retina. It helps filter ultraviolet rays from the sun. It also helps prevent age-related macular degeneration (ARMD) amongst elderly and the instance of cataracts. One of the main content of these nuts are a calcium and phosphorus. These are essential for the healthy development of bones, even teeth. Without enough amount of this vitamin, you can lose your bone mass. You might also develop diseases like osteoporosis and skeletal deformation. Yes… cashew nuts are good source of copper. This mineral eliminate free radicals from the body. Consumption of these nuts is essential in the formation of red blood cells. This helps avoid blood diseases such as anemia and other iron-deficiency diseases. Cashew contains fat – this is what most of us knew. So we avoid eating it so we won’t be gaining weight. But what we didn’t know is it contains healthy unsaturated type of fat. Study shows that including this unsaturated fat in our diet helps in weight and fat loss. These healthy dietary fats are present in cashew nuts. It is also important in the metabolic process of burning excess fat. Tossing some cashews on your oatmeal or salad helps reduce the risk of developing gallstones. These stone-like deposits usually contain cholesterol and builds up in our gallbladder. Having gallstones is painful and can completely impair the function of the gallbladder. One may argue that cashew has a strong sweet taste. Most likely people with diabetes will scratch this off from their diet list. But you will be surprised that cashew nuts are part of the diet of most diabetics. It is found that it regulates insulin and controls the blood sugar level. Most importantly, it also helps prevents type 2 diabetes. To have a healthy body, one must have a strong immune system. Cashew nuts contain zinc. Intake of zinc is an important aspect in our nutrition. It strengthens our immune system and prevents our body from acquiring diseases and bacterial infections. Now you can save up money from your salon visit. Eating cashew nuts in the comforts of your home will give you a healthy hair too. As mentioned earlier, copper is present in cashews. Copper also helps in the production of melanin. The presence of linoleic and oleic acids from these nuts also enhances hair color and provides a silky-smooth hair texture. Even if there is a lot of technological advancement in the medical field, this deadly disease has still no cure. Good thing we have cashew nuts that help fight against cancer and gives people a second chance on life. People undergoing treatment for cancer or tumor are strongly advised to consume cashews. It is known to have antioxidants such as anacardic acids, cardols, and cardinols, which are effective in their treatment. Studies also show that these nuts contain proanthocyanidins. This stop tumor cells in dividing and increasing. This buttery and sweet nut is not only a delicious snack. Most importantly it is a nutritional punch of minerals and vitamins. With all known benefits, these uniquely-carved shaped nut is worth the hunt in your bowl of nuts or trail mix. Be the first to comment on "Top 10 Reasons Why You Should Eat Cashews"